Approximately 30 kilometres out from Cairns in Tropical North Queensland, Fitzroy Island offers a stunning holiday destination surrounded by the World Heritage listed Great Barrier Reef. 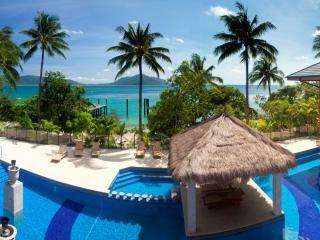 Covering 339 hectares, Fitzroy Island is the perfect mix of pristine beaches, brilliant blue water and lush rainforest. Fitzroy Island is the ideal holiday destination for relaxation, and focuses on getting back to nature away from the distractions and stresses of modern life. Architecture on the island is designed to harmonise with the surrounding natural environment and offers warm hand carved timbers, stylish water features, natural textures and stone and soft lighting to maintain a laid back ambiance. There are a range of accommodation options which integrate seamlessly with the lush vegetation, golden beaches and crystal waters. However there are also an excellent range of onsite facilities to further indulge you on the island including a restaurant, expansive outdoor pool with swim up bar, a games room, indoor movie theatre and even a general store for all your needs. Fitzroy Island has a range of island accommodation with a selection from four and half star Island Suites to 2 Bedroom Island Suites and Resort Studio rooms. Although there are plenty of facilities to enjoy, guests on Fitzroy Island tend to prefer to relax and enjoy the spectacular natural surrounds on the island. Discover the unmatched beauty that awaits with a stroll through the Secret Garden and continue through the rainforest to the Lighthouse and Summit Trail offering panoramic views out over Little Fitzroy Island and the Great Barrier Reef. The surrounding coral reefs are ideal for snorkelling and just 1km from the main resort you'll find the island's most popular spot, Nudey Beach. For a relaxing tropical island holiday within easy access of the mainland, you can't go past Fitzroy Island for a stunning holiday destination that will allow you to unwind and experience peace and tranquillity without compromising on comfort.